The story of a teenager who burgled Buckingham Palace and stole Queen Victoria's underwear sounds like it should be a work of fiction. But Edward Jones's life was no fairytale and he was caught with the monarch's clothing down his trousers. The story of possibly the original celebrity stalker has been fully chronicled for the first time. Dr Jan Bondeson, a senior lecturer at Cardiff University, spent five years researching his subject. He used newspaper reports from the era and the result is his book Queen Victoria & the Stalker. 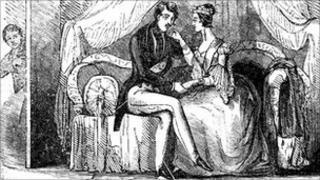 Dr Bondeson, who lives in Newport, said: "Edward Jones was a very weird character and apart from Queen Victoria, he was never interested in women. "He was a very solitary character but he was not schizophrenic or classed as mad, just odd. "He was extremely ugly, with a wide mouth and low brow and he never washed, which is why people thought he was a chimney sweep." Dr Bondeson said it was difficult to say how Jones's obsession started with Queen Victoria, who was monarch from 1837 to 1901, but the 14-year-old only ever targeted her when she was at Buckingham Palace. "He gained access to the palace through unlocked doors or unshuttered windows on the ground floors - there was no royal security in those days," he said. "He was caught three times and admitted being in there a fourth time but it was likely he was there many other times. "He took the queen's underwear the first time, and the third time he stole food from the kitchen and twice he was caught sitting on the throne. "He was caught with the queen's underwear stuffed down his trousers." He was tried by the privy council in secret but, because it was not a felony, he could not be sent to prison for a long time. "He was initially sentenced to three months as a rogue and vagabond but he kept stalking the Queen so the government decided to get rid of him," said Dr Bondeson. "They kidnapped him and put him on a ship to Brazil but he came back, so he was kidnapped again and incarcerated on a prison ship which was never allowed near the shore in case he escaped. "He was kept on board for six years." Jones, known as Boy Jones, became an alcoholic after his release and then became a burglar. He was deported to Australia where he sold pies but came back to Britain. Dr Bondeson said Jones's brother persuaded him to go to Australia again and he became the town crier of Perth. "He was very annoyed about always being known for being the queen's stalker and felt persecuted by the jokes, even in Australia," he said.